More Than 40 Reportedly Killed As Bombs Hit Hezbollah Area In Beirut : The Two-Way The self-declared Islamic State has purportedly claimed responsibility for two blasts on a busy street. Lebanon's Health Ministry says the attack killed at least 43 people and injured 239 more. 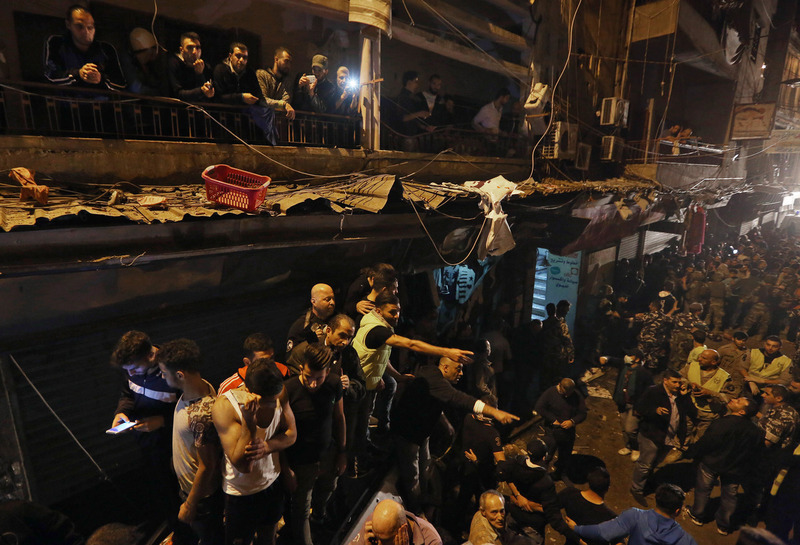 People gather near the site of a twin suicide attack Thursday in Burj al-Barajneh, southern Beirut, Lebanon. The self-proclaimed Islamic State has claimed responsibility for the attack. In an attack that Lebanon's Health Ministry says has killed at least 43 people and injured 239 more, two suicide bombers set off explosions within minutes of each other Thursday in southern Beirut. "The self-declared Islamic State has purportedly claimed responsibility for two blasts that hit a busy street," NPR's Leila Fadel reports. The attack occurred in an area that's under the control of the Shiite group Hezbollah, which is allied with Iran. "About 18 months ago, there was a spate of bombings in the area, largely claimed by Sunni Muslim groups linked with Syrian rebels," NPR's Alice Fordham reports. "In Syria — which is next door to Lebanon — Hezbollah has taken the side of the regime against the rebel forces." Alice adds, "The death toll from this attack is higher than any attacks in Lebanon in recent memory." "The United States will stand firm with the Government of Lebanon as it works to bring those responsible for this attack to justice. Such acts of terror only reinforce our commitment to support the institutions of the Lebanese state, including the security services, to ensure a stable, sovereign, and secure Lebanon."